Supreme Leader Kim Jong Un, Chairman of the Workers’ Party of Korea, Chairman of the State Affairs Commission of the DPRK and Supreme Commander of the Korean People’s Army, provided field guidance to the Junghung Farm in Samjiyon County. He was accompanied by Hwang Pyong So, Jo Yong Won, Kim Yong Su and other senior officials of the WPK Central Committee. He was greeted on the spot by Ri Sang Won, chairman of the Ryanggang Provincial Committee of the WPK, Yang Myong Chol, chairman of the WPK Samjiyon County Committee, and Won Thaek Bom, chairman of the Samjiyon County Rural Economy Committee. He looked round a potato plot of workteam No. 1 of the farm. Referring to the fact that potato blight and flood damage have an impact on potato harvest every July, he asked about the situation this year. The agricultural sector should take thoroughgoing measures of agricultural technique to prevent damage from low temperature and blight, the knottiest problem in potato farming in northern alpine areas, he said. Efforts should be channelled into livestock farming to establish the food production cycle, raise the soil fertility of potato fields, and manure and tend potato fields in a scientific and technical way, including weeding, earthing up, fertilizer application and extermination of harmful insects, he noted. Looking at farm machines and tractors of the workteam, he said that comprehensive mechanization should be realized with the help of modern and efficient farm machines as required by the reality which is changing and developing on a constant basis, and farm officials should enrich their knowledge to have a good understanding of the global trend of the development of farm machines and set an ambitious goal. When they take into full account how many and what kinds of farm machines are needed to do all of the farm work with the help of machines and inform the Party of it without hesitation, it will provide all of them, he said. It is the Party’s firm resolve to first build the farm into an exemplary unit for the modernization of farm machines and, on this basis, turn Samjiyon County and its farms into a model of our country whose comprehensive mechanization is on a high level and a farm of comprehensive mechanization where farmers’ ideal has come true, he noted. Farms should not only equip themselves with modern farm machines but also properly keep and manage them to increase their operation rate and serviceable life, he said. After making the rounds of a seed potato storehouse, he emphasized the need to build its capacity by properly estimating the quantity of seeds to meet increased potato fields, set up a well-knit production and storage system of seed potatoes and put seed selection on a scientific and technological basis. It is necessary to breed and introduce per-hectare high-yielding potato varieties and apply diverse species that taste good and ensure the quality of processed potato foods in production so as to raise the quality of potato production. Going round the farm, he set forth the plan and orientation for sprucing up the seat village of Junghung-ri, Samjiyon County. Saying that the Party would give positive assistance to building the Junghung Farm as a standard unit of rural development, he instructed to design and arrange dwelling houses in a specific and original way so that they could preserve the characteristics of mountainous area. 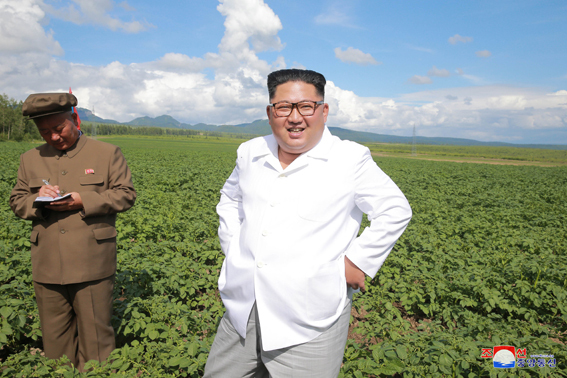 He called for producing a high yield of potatoes in the native land of Chairman Kim Jong Il in this meaningful year that marks the 20th anniversary of the Party’s policy on bringing about a radical turn in potato farming to realize without fail the wishes of the Chairman who was so anxious about the issue of potato farming in Ryanggang Province.